Stock markets are prediction markets. What does it mean that one share of Microsoft (MSFT) is traded at 23.93$ ? Basically it means that traders and investors predict that, given the current situation the actual value of all future profits of Microsoft will add up to 23.95$. Not more, not less. As the current situation changes, this prediction, made by the “wisdom of the crowds” will change accordingly. So it was particularly striking, that when on Monday, Sept. 29. US Congress stopped the $700 billion bailout package that would rescue the major banks. 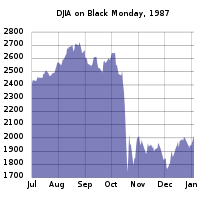 Traders and investors instantly predicted that the future profits of the would be much less (the Dow Jones industrial average plunged almost 778 points and continued to drop in the succeeding days). So prediction markets like Inkling etc are nothing new. The only new thing is that they predict other things that future profits of enterprises.